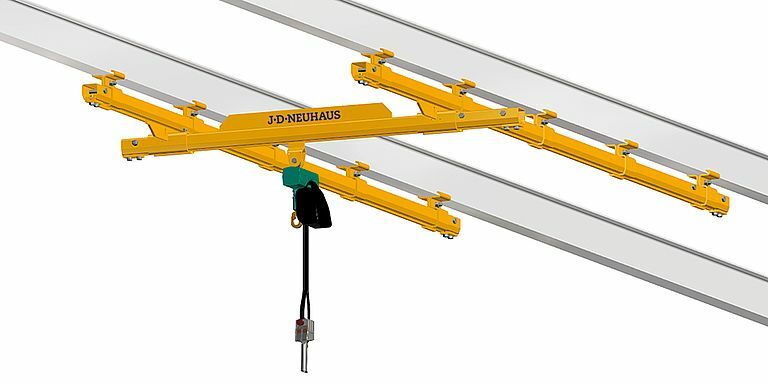 J D Neuhaus is now introducing a range of C rail and light crane systems for operation with the company’s established and successful mini air hoist range. Both the C rail/suspension tracks and the light crane systems are rated for use in explosion and hazardous dust-laden areas up to ATEX Zone 2, 22. Featuring high quality standard elements, the modular C rail systems/suspension tracks make for simple assembly and smooth movement of loads in accordance with individual customer requirements. The units, which are ideal for flexible material transport applications, are purpose-engineered to offer high durability when deployed in challenging environmental conditions. Similarly, the light crane systems offer easy adaptation to load and operating conditions. Available in four standard profile sizes, design modularity again provides users with the opportunity for light and easy assembly, the result of which is smooth movement of the reinforced crane bridge and optimal space utilisation at low headroom conditions. Air delivery is facilitated via hose trolleys in the crane rail. To help maximise system life, users can pick from a range of surface protections for the crane rail and trolleys, including coated, zinc-plated or chromated, while stainless steel is available as an option for lighter capacities of 100 and 200kg. Both the light cranes and C rail/suspension tracks give provision for straightforward system extension to accommodate changing requirements over a working life.The crane track length is fully selectable in accordance with customer requirements, while the bridge length can be specified up to a maximum of 6000mm as standard, with larger sizes available upon request. Track width is dependent upon the bridge length, but typically, a system with a carrying capacity of 125kg would dictate a maximum track width of 4500mm. This rises to 5000mm for carrying capacities of 250, 500 and 980kg. The carrying capacities are of course determined by the choice of pneumatic hoist utilised. Here, JDN offers its mini 125, mini 250, mini 500 and mini 1000 models, which are not only offer lube-free operation for use in hazardous areas, but a price-competitive alternative in comparison with other types of powered hoist. Principal advantages of JDN mini air hoists include minimal components for ease of maintenance, a wear-resistant motor braking system and suitability for horizontal pulling (in addition to conventional lifting and lowering). Where fitted with an extremely sensitive lever control featuring an emergency shut-off valve, lifting heights of up to 8m can be specified. Resilience and reliability are the key product differentiators, thanks largely to their explosive protection rating which makes them ideal for use even in the most challenging of operating environments. Extreme applications include oil and gas exploration in arctic temperatures as low as 45°C, along with underwater tasks such as ship hull repairs, and plenty of others in demanding sectors like mining, the chemical industry, heavy plant construction and many areas of logistics. The new JDN Mini is the best in class when it comes to operational safety. With features such as its new redundant fall support, the only one of its kind worldwide, and newly developed limit stops. Higher working speed, longer lifetime, drastically reduced maintenance times: the new JDN Mini is a paragon of efficiency with the lowest total cost of ownership (TCO). with extremely low headroom, for lube-free operation and application in hazardous areas. Made in Germany, engineered for extremes and precisely right for big bag handling, e.g. in the pharmaceutical, chemical or food industries. The JDN big bag handling air hoists: with extremely low headroom, for lube-free operation and application in hazardous areas. How can you be sure that internal and legal regulations are being observed? How can you guarantee that your JDN equipment is being maintained by professionals? The best way to make sure is with JDN Global Service. You’re safe with us! The JDN PROFI motorised trolley is particularly heat-resistant thanks to motor cooling through compressed air, explosion-protected, insensitive to dust and features capacities from 0.25 to 20t. Made in Germany, engineered for extremes. JD Neuhaus's PROFI JDN Subsea hoist works down to 70m water depth. Its compressed air or hydraulic drives make it suitable for horizontal/oblique pulling. It is safe and easy to operate. Engineered for extremes, perfect for underwater applications. Explosion-proof pneumatic or hydraulic hoists and crane systems from J.D. Neuhaus are reliable in the extreme. The equipment performs in the scorching heat of the metal processing industry or in any one of 70 additional industrial sectors world-wide. Explosion-proof pneumatic or hydraulic hoists and crane systems from J.D. Neuhaus are reliable in the extreme. The equipment performs whether on the stormy high seas or exposed to the harsh conditions found in over 70 industrial sectors world-wide. JD Neuhaus' JDN PROFI with a lifting capacity of 75/100t, is up to 50% faster and achieves energy savings of up to 50% compared to previous models. Made in Germany, explosion-protected , engineered for extremes and perfect for ship building/repairs.